He began drawing when he was a child, trying to give shape to his ideas, and opting for a self-taught career. 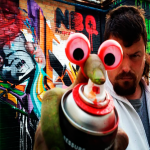 He stands out for his skill using spray-paint in most of his works, be they workshops, artistic decorations, or murals, totaling more than 1,500 works of different styles, although the predominate style is realism. “Once Upon a time in the West” will be the chosen film. With the performance of pianist Alberto de Paz: “Tu gran banda sonora western” (Your Great Western Movie Score). 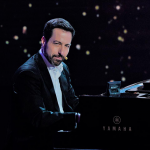 The well-known pianist-showman and runner-up in the TV program Got Talent Spain, Alberto de Paz, will offer a show that combines music, humor and improvisation: “Tu gran banda sonora”. This time, Alberto de Paz will revisit the most famous and unforgettable Western film scores, as well as some other surprises. Opening of the exhibition dedicated to Carlo Simi: his creations for Once Upon a Time in the West. You will find a wide variety of beers and food from Germany, concerts and activities suitable for all the audiences.